Each quarter, I like to share updates on our investment portfolio, family spending, and blog statistics. The fourth quarter has come and gone, along with a very prosperous year. In 2016, the PoF Portfolio increased 11.5%, and 2017 was even better. I don’t know how long this will last, but we’re off to a great start in 2018 with about a 4% gain in the first three weeks. Blog performance was phenomenal, thanks to readers like you. Let’s get to all the details. First, let’s look at the detail of my asset allocation. 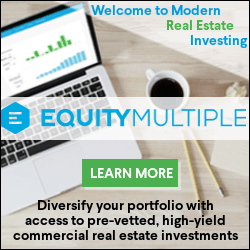 I’ve made one change since my most recent update, adding my alternative investments which include microbrewery investments, crowdfunded real estate investments, and a small portion of Passive Income MD. These will be in the spreadsheet, but not reflected in the screen captures from Personal Capital below. These “other” investments aren’t as liquid as the index funds, but nevertheless have value and are assets that can help fund our retirement. I like to say that the brewery investments, particularly the dividends I get from them, are as liquid as liquid gets, but just because I can get hoppy treats any time I like doesn’t mean I can get the money out just as easily. Our donor advised funds are not tracked here, as that money’s no longer ours, but the value has grown 6.5% despite our year-end giving of about $10,000 after we topped them off in November. Our 529 Plans aren’t in the spreadsheet either, but I’m happy to say that we can now consider them fully funded with many years to grow (our boys are in 2nd & 3rd grade). We may continue funding up to the amount at which we get a state income tax deduction. Leftovers can always be left to grow for other relatives, including future grandchildren. About half of our retirement dollars are in mutual funds in a taxable account. If you add the cash and “other” category, over 55% of our retirement assets reside outside of retirement accounts. We’re accumulating cash in anticipation of building a home on our recently acquired lakefront property. That project will also be funded by selling our second home (and eventually our primary home), but we’ll need some money to get started, so I’ve stopped investing in the taxable account for the time being. Only about 17% of our assets are in tax-deferred accounts, and as the 457(b) is depleted within the first decade of retirement, that number will continue to shrink. I like the tax diversification we’ve got, and I fully intend to convert the money in the 401(k) to Roth over time when our income and tax burden drops. The new lower marginal tax brackets (particularly if you’re married, filing jointly) offer an attractive option to convert tax-deferred dollars to Roth when retired. Any couple with a sizable tax-deferred position can fill up the 24% tax bracket all the way up to a taxable income of $315,000. Much like my hometown NFL team in purple and gold, our portfolio saw a lot of wins in the last quarter of 2018. Unlike the NFL team, that good fortune continues in the new year for our portfolio. In the fourth quarter, we had returns of nearly 5%, while the S&P 500 returned just over 6%. This calculation is done by Personal Capital, which allows you to log into multiple investing platforms at once and see your data in aggregate. Returns were held in check by the Total Bond Fund, which actually lost 0.2% of its value in the fourth quarter of 2017. I typically keep about 10% in bonds and cash, but that’s crept up closer to 12% as I save for the building project that we hope to begin this summer. On the other hand, Berkshire Hathaway continued to outperform the S&P 500, returning over 8% in the fourth quarter alone. My investment in Warren’s opus only represents 0.5% of the portfolio, though, so it didn’t move the needle much for us. How did the entire year go? Unlike last year, we didn’t top the reported returns for the S&P 500, but our returns weren’t too far off. Our portfolio returned just over 18% in 2017. I’ll gladly take that any year. The Rule of 72 tells me that my investments would double in four years with steady returns of 18%. Compound interest is akin to the feeling you get when you step off the treadmill after a good run. Your legs continue to propel you across the gym without conscious effort. You can’t help but move forward. Here’s how our returns look in graphical form. Much like the fourth quarter results, bonds did what bonds tend to do, which is “smooth the ride” and move total return a little closer to that flat line. Our REIT investments didn’t fare all that well, either, which is not terribly surprising in the midst of rising interest rates. Still, the mutual fund returned nearly 5% after dropping below the 0% line several times in the first half of the year. The less-than-stellar returns we saw in the above categories was at least partially offset by the spectacular returns from emerging markets. I’ve got a bit more than 10% of my overall portfolio in Vanguard’s emerging market stock index, and it returned 31.37%. That’s a lot of percentage points, just topping the number of points the Vikings lost by in the NFC Championship (their 6th consecutive loss in an NFC championship game)! In 2016, we spent $62,000. You’ll never believe how much we spent in 2017! Scratch that. You’ll totally believe it. We spent $61,000 in 2017. We were on pace to spend around $55,000, but a $22,000 fourth quarter busted that. All in all, I’m impressed and frankly surprised we spent less this year than last. 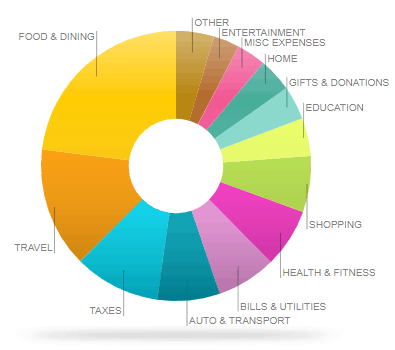 In addition to the above expenses, we also spent most of November in Mexico, traveled for the blog (FinCon), and generally tried to prioritize happiness over frugality for frugality’s sake. Fortunately, we hate to waste money, so the frugal choices are often the happy choices. No mortgage or rent payments. We are debt free. Compared to last year, our Food & Dining bill was over $2,500 higher. I think this can be attributed to more travel which leads to more dining out. I don’t imagine that will change much in 2018 as we travel even more. My resolution to run a mile or more for each beer consumed should cut down on the alcohol bill, though! The travel bill would be substantially higher if we didn’t score so many free flights via our credit card travel rewards strategies. As we transition into “slow travel” mode for most of our trips, we should be able to keep the cost per day away more reasonable as compared to the manic one-week vacations we were once accustomed to taking. The education expenses are a combination of piano lessons for the boys, a Spanish program we were using online and the tuition for the four of us in our Spanish immersion experience from November. As of 1/12/2018, the site had 339 published posts and 38 pages. 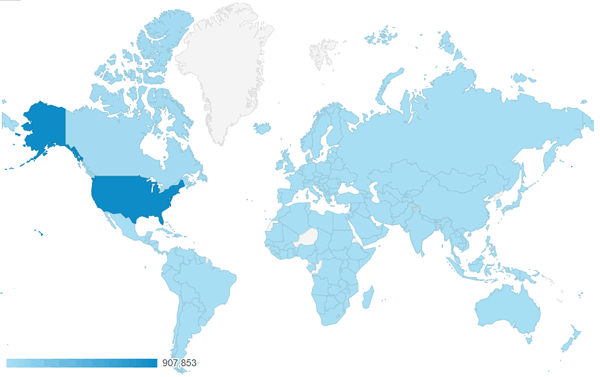 These have been visited by people in 205 countries, and I’m happy to report that list now includes Madagascar for the first time! Still no Greenland or North Korea. I was successful in reaching far more people in 2017, technically the site’s first full year, although the site was live for all but eight days of 2016, as well. The pageviews increased from 404,400 in 2016 to 1,504,175 in 2017, for an increase of 372%. I don’t anticipate repeating that percentage increase in 2018, but the numeric increase is within the realm of possibility. I could point to many reasons that this happened, and my blog tips page highlights the things I’ve done to grow the site, but the biggest factor has been a partnership with The White Coat Investor in creating the WCI Network. The Backdoor Roth post has jumped to the top after I updated it with fresh screenshots in 2018 and re-published it. The Tax Reform post was new in December and has been quite popular, as you can see. Thank you to Dr. Stanton Elseroad for his contributions to the bulk of that post. Google traffic has (finally) become a decent source of traffic. #1,2, and 5 do well in search engines. The 3rd and 4th posts were both featured by Doximity. The comments on the Regret post were interesting (behind login). Reddit remains #6. 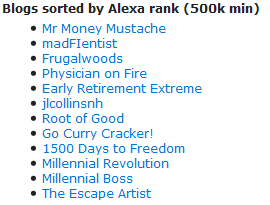 I’ve been listed as the 4th most popular financial independence blog in their FI subreddit sidebar, which puts me among some great company. I’ve mentioned this before, but whitecoatinvestor.com would very likely show up as #1, but some setting must exist that keep me from seeing those clicks in the Jetpack Site Stats. Passive Income MD, the newest addition to the WCI Network, is new to the Top 5. We had a blast at FinCon, and Camp FI Southeast was a great way to spend some time with others who are working towards or have already achieved Financial Independence. Mr. 1500 was a speaker there, and he wrote up a fun recap. I’m looking forward to another meetup of like-minded individuals at the White Coat Investor Physician Wellness and Financial Literacy Conference in early March. I’m excited to put some faces with the names of the commenters on the site and forum. I’ll also be speaking at Camp FI Midwest. This one is close to home in Minnesota this coming August. 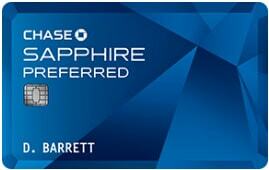 Finally, look for me on stage for the NYSE closing bell on January 30th. I couldn’t turn down the invite from Inspire Investing to be a part of this. Tune in to CNBC at 4:30 Eastern to see my first televised appearance! How did 2017 treat you or your portfolio? What are you looking forward to most in 2018? hello Dr, pretty comprehensive overview. You had another solid quarter, and did well for 2017. Think that you expenses are very reasonable, you seem to have found your happy spot as far as a balanced approach of life is concerned. Hat tip to you sir, impressive! By the way, I think someone moved your cheese. A slice of it, anyway. Great year! Can’t wait to see the new house, sounds like the perfect place to retire to! Calm and peaceful, on a lake. I have a confession to make, I spent some time on your blog while I was in Madagascar last fall hanging on the beach. So it was really an American hitting it. Great job on the low spending, that’s pretty darn low considering a long trip to Mexico. When’s your next trip to Greenland? I’ll get right on those…. Who knows, maybe this is the year Kim Jong-un will finally need help with his backdoor Roth? From what I hear, he’s sent a number of generals into early retirement, but I don’t think they got to collect on their pensions. I don’t think the 4% rule applies when you’re subjected to firing squad. Great post! So encouraging to see how your blog has taken off. You have been consistent and thorough. A lot of really great content. Great job in staying consistent with your spending! I look forward to the day when our fixed expenses drop dramatically as we get rid of unneeded insurance prodcuts, mortgages, etc. Good job on keeping your expenses low and on growing your portfolio and blog! I gotta go check how many RSS and Feedly subscribers I have. I have never checked that before! Congrats on all your success (especially the Alexa rank!) and your continued frugality. I’m not sure how you (and more importantly your wife) can do that. Not many of us spend average amounts when earning above-average returns and income. You will be fine in “retirement.” I spend about twice what you do and my friends think I spend less than anyone they know. p.s. 3 weeks in HI. I’m doing something wrong with my life! Funny how it’s all relative. Your friend think you’re super-frugal. We’re spending half. Meanwhile, I spend about double that of some of the more famous FIRE bloggers (i.e. MMM). There’s room for you in Hawaii. I know of at least 3 other bloggers / podcasters that I’ve been in touch with who plan to be on the same island(s) as us at the same time. POF only 56,186 people live in Greenland. You may never have any readers there. Congrats on your success. I track my spending also it just became a habit. I encourage others to do it so you can figure out retirement goals. Keep up the good work. I am still trying to read last Sunday’s best posts. Another impressive quarter. Your blog growth is incredible, but well earned. Congrats and I look forward to watching your continued success! Congrats POF! I remember in the past you mentioning how personal capital your index is somewhat skewed due to not accounting for reinvested dividends or something along those lines? Could you elaborate on that? They argued my point on Twitter, but their representation of the S&P 500 doesn’t include reinvested dividends. If you compare the performance of the S&P 500 index fund to their orange line, the index fund comes out slightly ahead. Over the course of a full year, that difference can be a couple percentage points. Fortunately, they track your portfolio accurately; it’s just the benchmark that’s a little off. When you say the performance of S&P index fund to theirs are you using VFIAX? I have two S&P 500 funds (VFIAX, and SWPPX) and each have different results compared to their orange line. The only one I own is VFIAX. Could the discrepancy be explained by different expense ratios? Maybe, .04% VFIAX vs SWPPX @ .03%. I played around some more and realized I may have actually clicked on SWISX which performed better. My mistake, too many letters!!! On a side note as an Atlanta Falcon fan sorry the vikings didn’t win. Nothing will ever compare to last years super bowl loss, where for a moment I almost let my mind go to that place where you are champs. Man it hurts, prepared me well for this year as a Georgia Bulldog fan though. Great recap and analysis! I was most excited about your blog report hehe. It’s so inspiring to see your site growing so fast and successfully. Content is really king! I am curious how your children’s school handle the absences with the extended Hawaii trip upcoming. Here in Texas, we are allowed I think 18 days of unexcused absences before we can be taken to court about it. Two of my three are competitive gymnasts and we miss 5-10 days per year for gymnastic meets, and there schools throw a complete fit about it (even though their gym time counts as a graded class for off campus PE). Congrats on the awesome numbers for the portfolio and blog. Have fun in Hawaii too! We went to the big island and Maui last June, and it was awesome. We met with our principal last year and told him we’d like to take as many as three trip of up 3 to 4 weeks. He had no problem with that as long as we keep up with the schoolwork while away. Frankly, we were surprised, but they’d much rather keep us in the school system and get those tax dollars for the district than lose us to homeschooling, so it makes sense. It helps that they’re in 2nd and 3rd grade and in an accelerated program. There’s more leeway than there would be in middle school or high school. Wow you guys certainly blew that spending out of water in Q4. Must be all that beer from FinCon. 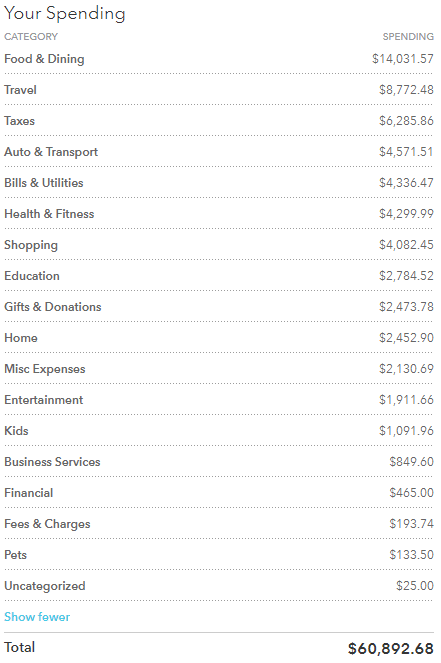 :p We ended up spending $51,144.77 CAD ($40,915.82 USD based on 1/0.8 exchange rate) in 2017. Berkshire! Any chance you’re going to Omaha for the meeting this year? A Longmont contingent is going to road-trip out to Omaha for the big party. Do it! Home building stuff is fun to read about. I look forward to seeing your new abode take shape! I want to make it to WarrenPalooza soon, but it’s not in the cards this year, unfortunately. If we’re in the country, my younger son will have his first communion that weekend. There’s a good chance he’ll be taking it in Ecuador or Peru, though. I think we can find a church down there somewhere. Hopefully, we’ll be able to make it in 2019. Warren and Charlie, hold on for just one more year! I know. Not sure what the over under is on them both showing up for the meeting for the next few years, but it’s not a sure bet. Great recap for the year! And an impressive first full year for the blog. Bravo! That’s pretty cool you’ll be at the NYSE for the closing bell. Will you be going to FinCon again this year in Orlando? Thanks! And yes, I am booked for Orlando. You? What a huge overview. Nice to see all your improvements. Thanks for the kind words. I’m glad the word is getting out about the tax changes! 1. How much would I have to pay in taxes if I did that for 26k? Can I do the 26k at once or can I only do $5,500/yr? 2. Should I wait till my husband’s income is lower (we’re anticipating his income will go from 215k to 150k in the next 2-3 years since he’s feeling burnt out and wants to work less) or wait a bit when the market is lower before converting to a Roth? 3. What should I do with the 4K that is still in the 403b in valic with my old employer fund? Leave it in the 403b for now (but I think valic has high fees)? Roll it over to add to the existing rollover Ira with fidelity or open a new account with vanguard? Thanks for taking the time to read my long question. YES! I’ve been counting down the days for this post to show up in my email inbox. Thank you for the time you invest in these recaps. I’ve actually tracked your investment optimizations each quarter to see where you make changes over time. Very helpful! Congrats! You crushed it on all fronts in 2017. Can’t wait to watch the lakefront property take shape. Thank you, Grant! We’re excited for the place, too. Looking forward to having only one place for the first time in a long time. If I crushed it in 2017, you demolished it beyond all recognition. Thank you so much for sharing! I am very intrigued by your spending (or lack thereof) and the simplicity of your portfolio. I will likely be gradually reducing my clinical work over the next five or six years and look to really streamline things over this period. Looking forward to meeting you in person over a beer at the WCI conference in March. We have 2 children, ages 15 & 10. They both want to go into medical school and we are planning to fully pay for their education. Our eldest has $230K in his account and the 10yr-old has $120K. They certainly have more than most! On one hand, you can always cash flow any shortage if you’re still working. On the other hand, any leftoveromey can be used for other relatives, grandchildren, or even yourselves! Only you can determine when to stop funding. To be honest, Philip, I didn’t start tracking our spending closely until I had a website and curious readers. I can say that our lifestyle hasn’t changed a whole lot except for the fact that we’re traveling more now that I work part-time. But we’ve been free of those other costs (mortgage, term life, disability insurance), and the only change then was that we were saving more, not spending more. Thanks for sharing your detailed retirement portfolio. I am 2 years into my attending carrier and just recently started contributions to my retirement accounts. I don’t have much money in these accounts yet, so decided to start with simple portfolio first. 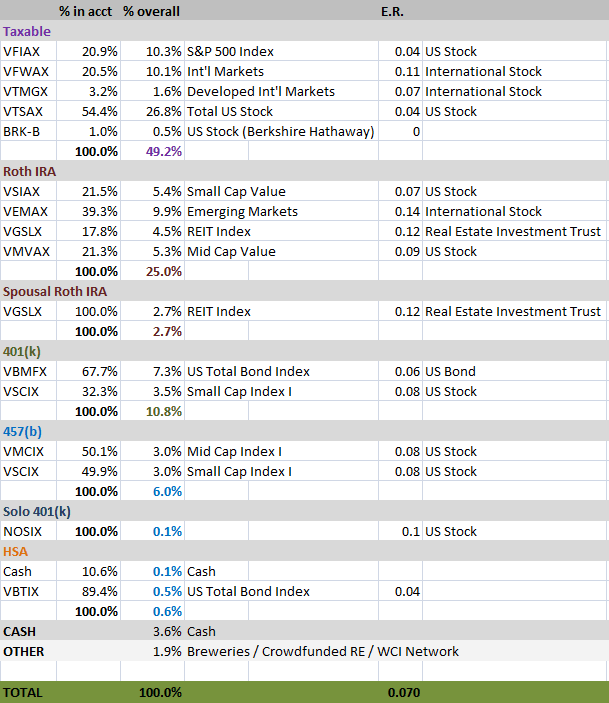 (1) My Roth IRA: Vanguard 500 Index Fund Investor Shares: VFINX (100%). (2) Wife’s Roth IRA: Vanguard Target Retirement 2035 Fund Investor Shares: VTTHX (100%). (3) For mine 403(b), mine 457(b), mine 401(a) and wife’s 403(b) : Vanguard Institutional Target Retirement 2035 Fund Institutional Shares: VITFX (100% for each account). Both VTTHX & VITFX have similar profile of 47.5% U.S Stocks, 31% International Stocks, 15% U.S Bonds and 6.5% International Bonds.